Erhu player Song Fei, born in Tianjin in 1969, is know as the “queen of Chinese traditional instruments” because she can play 13 kinds of instruments including Erhu, lute and koto. When Song was seven years old, she started learning Erhu from her father Song Guosheng, who is a professor at the Tianjin Conservatory of Music. 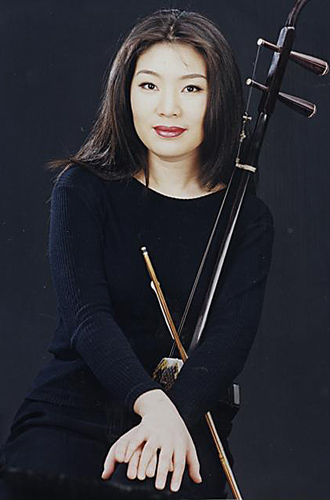 In 1987, she entered China Conservatory of Music and continued to learn Erhu and Koto. She became a professional Erhu player in Central Orchestra in 1991, and has gatehered performing experience around the world. However, she chose to be a teacher instead of being professional Erhu player because she hopes more young people will learn to play and appreciate Chinese traditional instruments. Erhu is a traditional string instrument with two strings and a bow. It is known in the west as the “Chinese violin” or ” Chinese two-string fiddle”. Erhu developed during the Tang dynastry in China and has been played for more than two-thousand years. There are a range of traditional playing skills for Erhu, primarily divided between bow techniques and finger movements. With the bow, players employ strokes such as full, long, short, front, behind, pull, and push. For the fingers, skills include vibrato, glide, shake, and harmonics. The most important thing for playing Erhu is for a player to be able to coordinate between his or her two hands. Introduction: This song is from Erhu player Song Fei with China Central Chinese Orchestra. It is a piece of sad song and reflects on our inner feeling. The whole song has five variations with the music of statements and it extends full emotion. Introduction: This song is from Erhu player Song Fei and is a demonstration video for people who want to learn this song. The song describes family members get together and spend a good night. When people hear this song, they may miss their family and image a picture of family together.